This guide covers resources for conducting citation analysis, finding impact factors and journal rankings. 1. Go to Scopus. The default page is the Document search. 2. Enter your terms and select the search fields from the drop down list. These elements can include article title, author, source title (journal in which article was published). It is recommended that at least two of these elements be used. 3. The document may be selected by clicking on the title.You can set a citation alert for the document, which will let you know when the document is cited. 4. Use alerts to receive email notices when new documents are loaded on Scopus. From the Alerts page, you can create alerts, Note; You must be logged in to set an alert or work with your saved alerts. 1.Go to Scopus, click on Search. Select Authors from the Documents Search form to open the Author search form. 2. Enter the "Author Last name" and "Author first name" in the form and click Search. 3. Select the relevant entries. There may be several entries that represent a particular author's body of work. Choose all that are appropriate and click View Citation Overview. In the search results, you may also click on an author's name in a record to open a specific author's profile page. 3. Scopus will display a Citation overview for the cited references to the author's articles. 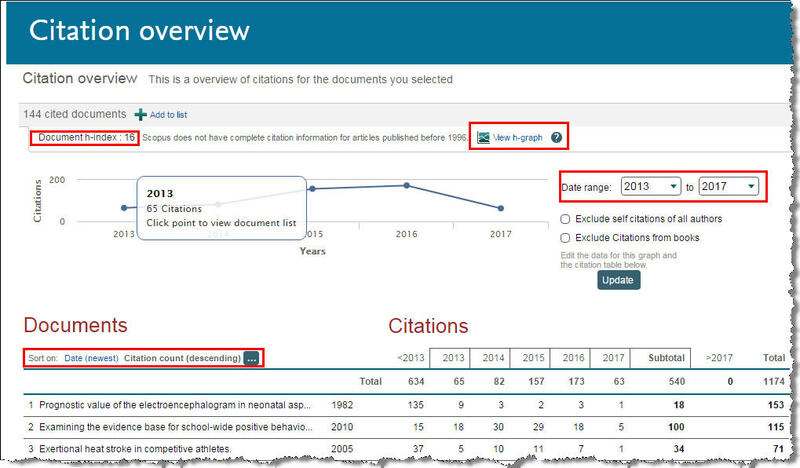 The Author h-index (an author impact metric) for articles tracked by Scopus will be displayed at the top of the screen. Note: Scopus citations only go back to 1996. If you want cited references for pre-1996 articles, you will have to search some other tools identified in this Guide. Follow the directions below on how to conduct citation analysis for a department or an academic unit. Go to Scopus and select search from the top menu options. Click on Advanced. To find articles published by a particular school or department, select the Field Code AFFILORG from the right Field Code by clicking on it and selecting ADD. This will add the AFFILORG() to the search form. In the parentheses, enter the University. To combine the name of the University with a department keyword, use the operator W/ from the Operator box on the right to add it to the search form. Edit the query to include the number after the w/ and a department. Click Search. Note: the w/n connector looks for your keywords within n number of words of each other. "n" can be a number from 0 to 255. Either word may appear first. In the above examples, your search will find results where “University of Connecticut” appears within 5 of words such as Business, Education, Kinesiology, or “Evolutionary Biology”. Caveats: Scopus only provides cited references from 1996 onward. Like Web of Science, it's citation count also does not include any other publications of the Unit including books, conference papers, patents, and other non-journal documents or articles from journals that it does not index.